kidslooklikekats: Wayne Shorter: "Adam's Apple". 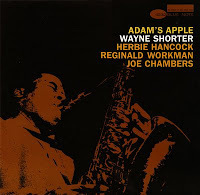 Wayne Shorter's release of Adam's Apple in 1966 coincided with many other soon-to-be classics, including John Coltrane's Ascension and Larry Young's wonderful organ-jazz album Unity, but I've got a feeling (and you may know it well) that this six-song album takes "Best Jazz Album of 1966" in my book. I thought I'd never find anything harder-bopping than Speak No Evil, but I gave in and sent off for this LP, and have been convinced ever since; truly a collection completer. Adam's Apple collected pianist Herbie Hancock, bassist Reggie Workman and drummer Joe Chambers, and was Shorter's fifth release on Blue Note records. The record opens up, with some reservation, to its audience with Workman's bass plodding the hefty, low hum of our eponymously-titled first track "Adam's Apple", and Chambers ticks his way in on the ride, Hancock just behind him, saving plenty of room for Shorter's delicate-to-shrill dynamic mastery. As he creeps in, the tune fleshes up and becomes the very essence of simplicity disguised in complexity (or perhaps the other way around). "502 Blues (Drinkin' and Drivin')" concretes my appreciation for Hancock's delicate touch he so flawlessly lends to nearly every project he's associated with, and it becomes evident that his influence has been noted by Shorter through the song's atonality. "El Gaucho" is my personal favorite track off the album, introducing a bossa beat and some delectable solo spots between Shorter and Hancock, as well as that absolutely inimitable bass and piano breakdown succeeding chorus key shifts. If you're spinning the LP, you're qeueing side B now. B sides get such a bad rap, and here's proof: "Footprints", perhaps Shorter's most widely-recognized hit, slowly rises to life like a chill Autumn breeze, and I'm now trying to decide how I could have ever claimed "El Gaucho" over "Footprints". I did, in fact, purchase the album for the song, having fallen head over heels in love after hearing the song only once. It's uniqueness is unprecedented. "Teru" lulls our weary souls away from the stabbing pressures of the day and into a soft, comforting mentality - and one we at once realize we couldn't easily pursue without assistance; think of it as a road map to, of all places, the place we truly call home, whether it be a childhood memory or a secluded scenic retreat. The 1966 classic finishes with one more hard-bopper in "Chief Crazy Horse", allowing the record a total running time of 47:58. For the Shorterholic and the novice alike, Adam's Apple remains an immensely enjoyable soundscape, and a soothing glimpse into a day and age when men still poured their heart and soul into the music they crafted.